I bought it from Perfect Miniatures in 1982, when I was 21. It came painted on the outside, but completely bare inside. The metal balconies were a later addition. I installed wiring for the lights, then decorated each room. It’s still an ongoing project….. 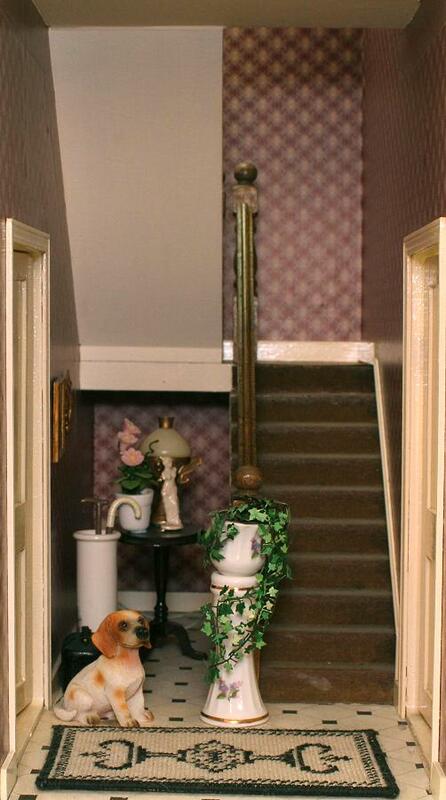 This is the kitchen in my dollhouse, featuring a carpet called “Gwen (cream)”. There is a “May (blue)” cushion on the rocking chair. You can see from this room that I love copperware. 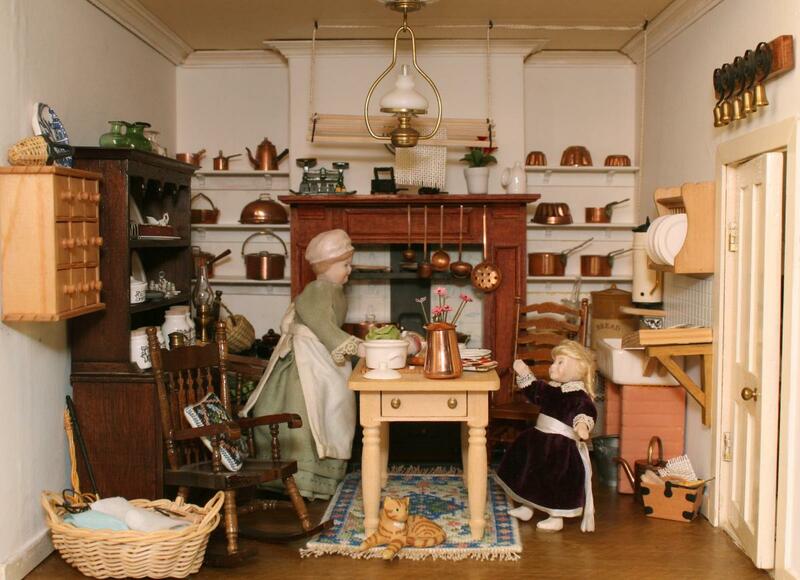 I real life, it’s too impractical, but in a doll’s house I can have whatever I want, so I have bought lots of copperware over the years – much of it from artisans at the Kensington Dollshouse Festival, where I used to be an exhibitor for several years. There is a small water heater next to the sink, which came from Sussex Crafts, and the kitchen range (not really visible here) was also from them. My favourite item in this room is the ginger cat in the foreground. 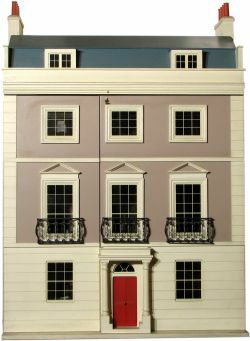 You’ll see, from the other images below, that I am rather partial to acquiring doll’s house scale cats and dogs – I have far too many of them really, but I can’t resist anything cute. 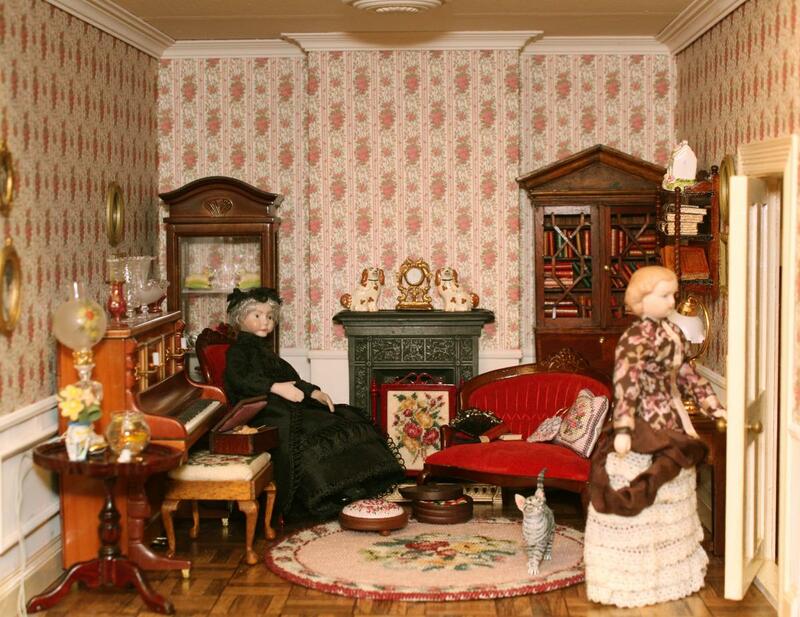 This is the Victorian parlour in my dollhouse. 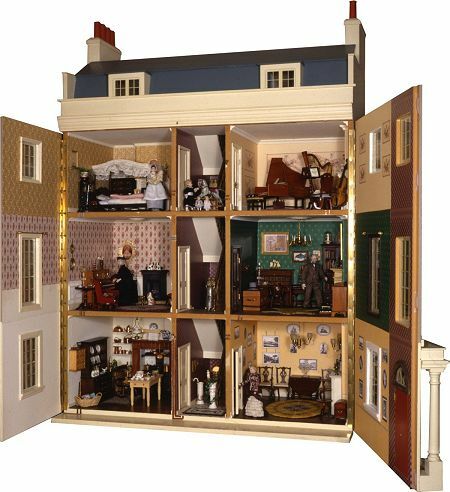 Yes, I know it’s a *Georgian* doll’s house, but the interior is set a little later than that. So, this parlour is definitely Victorian, with the typical buttoned sofa and chairs, and knick-knacks on every available surface. I bought the beautiful glassware from Glasscraft in about 2004, at a doll’s house fair in Pudsey, near Leeds. The piano that the glassware stands on is one of my favourite things in the whole house – it’s a non-opening piano by a woman called Linda Grant, who used to exhibit at the Kensington Dollshouse Festival. She sold pianos and harpsichords – many had exquisite paintings on the undersides of the lids, but I couldn’t afford those. But the piano is wonderfully made. The secretaire filled with books is an early piece by David Gooch. The pie-crust top table on the far left was a twenty-first birthday present to me from the people I used to work with. The top tilts upright (hopefully, not while it’s full of tiny things!). On the table you can just about see a tiny ivory pot, a quarter of an inch high. The lid is actually removable, and fits perfectly. Beside it are two teeny little wedding rings; a ‘wide’ one, and a ‘narrow’ one. The set is by David Edwards, and it’s gorgeous. There is quite a lot of my stitching in this room. On the floor is a carpet called “Bella“, which is one of the many carpet designs in my range, and which is stitched in needlepoint on 18 count canvas. At the edge of it, just by the widow doll’s feet, is a “Kate (pink)” footstool. At the piano is a “Tree of Life” rectangular stool, stitched on 32 count silk gauze. In front of the fire is a “Summer Roses” firescreen – again, stitched on 32 count silk gauze. The metal parts to make the frame come with the stitching kit for this one. On the sofa is a “Shell pink” handbag, and a “Lilian (pink)” cushion. I couldn’t squeeze in anything else! The bedroom in my dollshouse is dominated by a rather large four-poster bed, which I made from a Mini Mundus kit. It’s a lovely bed, but ‘takes over’ the room somewhat, as the ceiling in this room is only a little more than eight inches high. The linen press on the left is rather imposing too, and that was also a Mini Mundus kit. At the front of the room is one of my carpets called “Sophie“, with the matching cushion on the rocking chair by the door. Hanging on the arm of the chair is a “Delicate flowers” handbag, stitched on 40 count silk gauze. Behind the nursemaid, on the bed, you can just see the “Crinoline lady” teacosy, on a tea tray set with a cup of tea and a tea pot. The nursemaid is holding a tiny baby doll, which was one of the first things I bought for the house – before I had even decorated any of the rooms! I dressed her in scraps of lace, and meant to dress her ‘properly’ when I had time. That was about 30 years ago….. 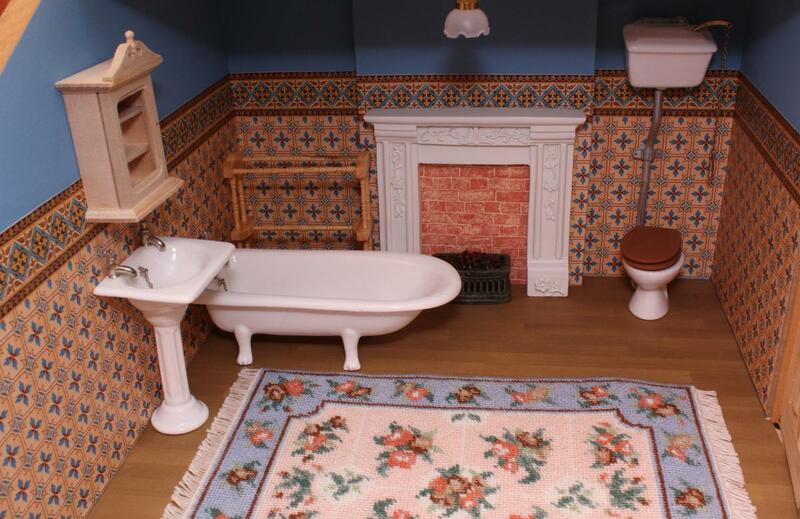 The bathroom at the top of my doll’s house is not yet finished. It’s in the mansard roof, and so has a shaped front to the walls, making it quite difficult to use the space sensibly. For now, I have placed one of my carpets called “Alice, large (blue)” in this room, but I’m not sure yet if it will stay there – it seems a bit too large for the space. The bathroom suite is from Lenham Pottery, and took me years to decide on! I was very tempted to get a flowery suite, but nothing seemed in scale. This one was perfect. I just need to ‘plumb it in’. At the moment, the pipework is held in place with Blu Tack. I was very pleased with the tile-effect paper for the walls, which is actually supposed to be floor paper. 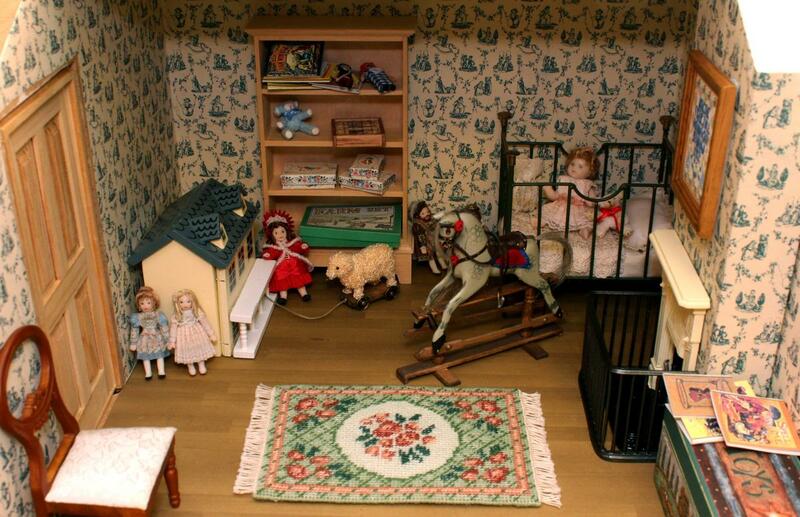 The nursery at the top my dollhouse is one of my favourite rooms. Despite being in the mansard roof, and so decorated almost last, I had been planning it since I got the doll’s house. So, I had been accumulating bits and pieces for it for years. 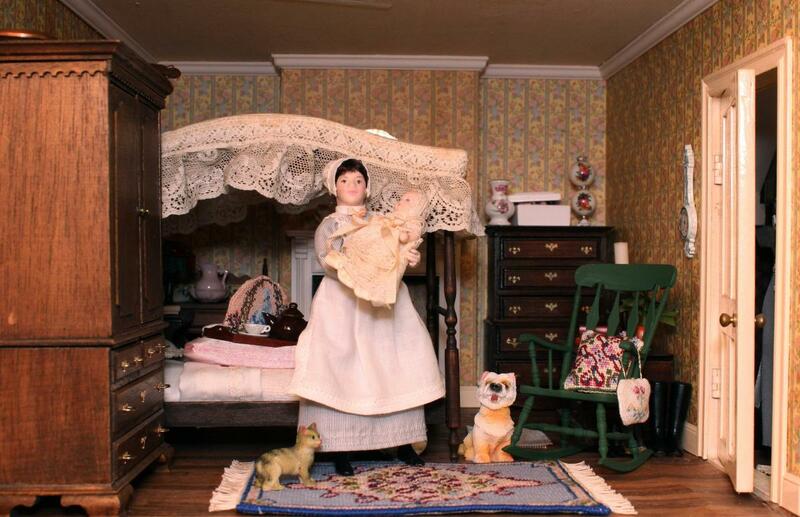 The baby doll in the cot is by Mary Williams, and is suitably ‘old-fashioned looking’. The little carpet in the centre of the room is called “Barbara, small (green)“. I wanted it to look delicate and feminine, as this is a little girl’s nursery. 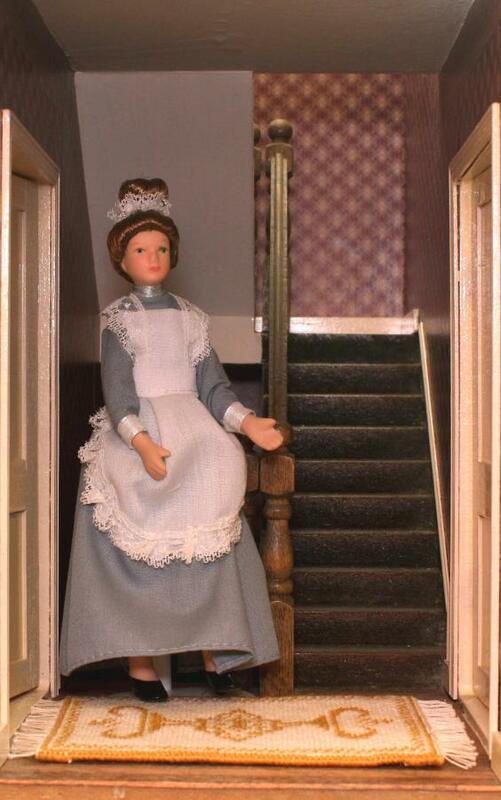 There are several dolls around the edges of the room – the one in red I made from a kit from Tower House Dolls, and was very pleased with myself for having managed to do it so successfully! The other four are by a South African dollmaker called Debbie Dixon-Paver. I love the miniature wallpaper in this room – it’s a special nursery wallpaper, with children playing, skipping, rocking horses, and so on, all over it. I’ve still got some things to finish in this room, such as painting the door and bookcase, and then stuffing it with more toys, but it’s coming along. 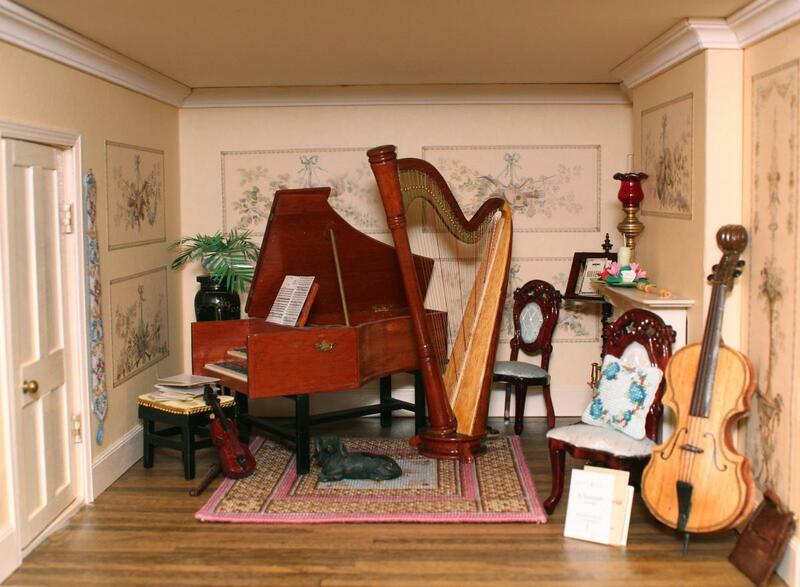 The miniature music room has a very Georgian style carpet called “Isobel” taking pride of place. I got the inspiration for this carpet from a full sized one at Ickworth House, in Suffolk. The harpsichord and harp in this room were made to commission for me by Tony Scammells, many years ago. He made wonderful instruments. On the chair to the right of the room is a “Flower ring (blue)” cushion stitched in needlepoint on 22 count canvas, which sets off the colour of the silk of the chairs in this room. The print panelled wallpaper is one of my favourites in the whole house, and the “Judith” bellpull by the door on the left echoes the pale beiges and blues of the wallpaper. On the mantelpiece you can just see an exquisite recorder, made by David Edwards. 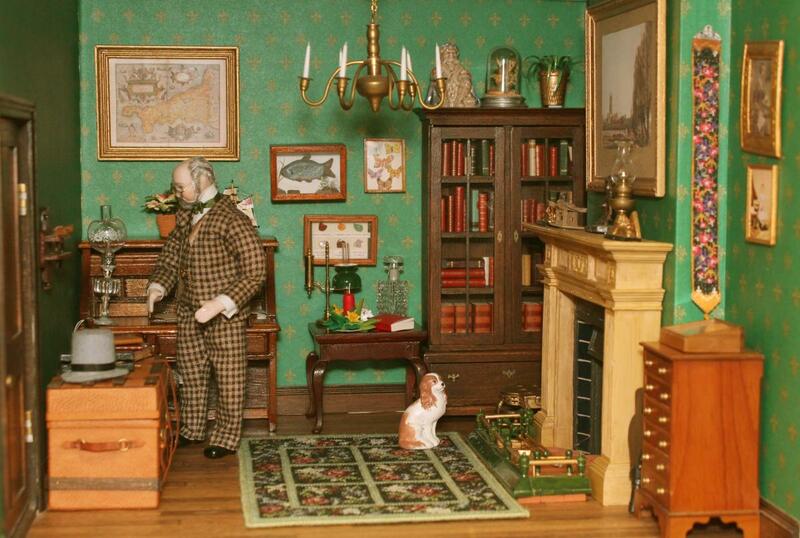 The study has dark wood furniture, and deep emerald green wallpaper, to give a proper masculine feel to this room. A rug called “Jessica” picks up this heavy feel, and the bellpull at the far right, “Berlin Woolwork“, also echoes that. The small chest below the bellpull is neatly made by Escutcheon. I received this as a leaving present when I left ‘paid work’ to start my embroidery kit business. I remember one of the other staff saying to me that it was one of the smallest, yet one of the most expensive, leaving presents they had ever got for somebody!! The man in the tweed suit was made for me by Lorna Treloar of Little Women. We had an agreement that she would make the man doll, and I would make an oriental rug for their stand at shows, in shades of deep pink and aubergine, and we would swop, rather than buy from each other. That carpet design was later put out as a kit called “Tara“. On the mantelpiece you can just about see in the centre, a figurine of a buddha. I dug this up in my back garden in Essex – I’ve no idea how it got to be there! The framed print at the back of the room is of a map of Cornwall – that is because my husband was brought up there. 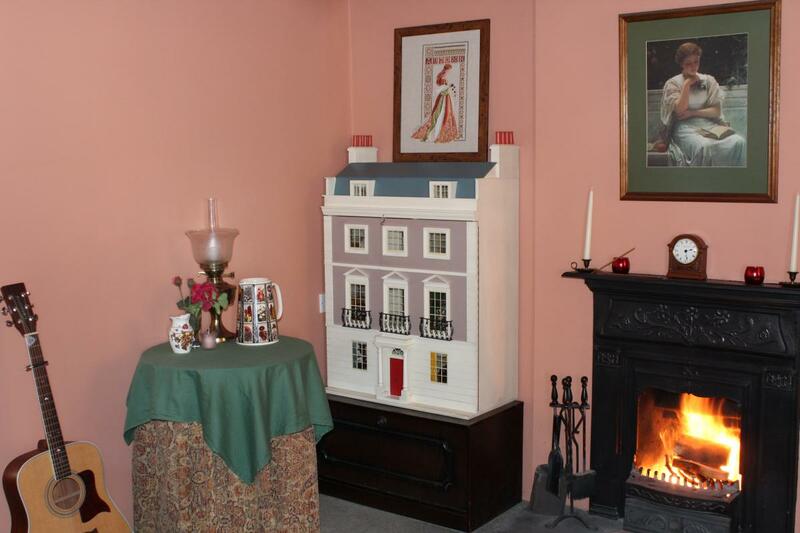 The dining room in my dollhouse is decorated in the style of a Georgian print room and features a carpet called “Theresa“. On the table, a “Summer Roses” table runner can be seen under a floral arrangement. There is a “Barbara (green)” bellpull at the side of the fireplace. Under the bellpull is a small wine chest by escutcheon – inside, the are very finely divided sections to hold bottles of wine. The little boy in the sailor-suit by the door is very sweet – he’s by Jane Davies, and he cost a fortune! He’s really carefully made. He stands perfectly, without needing a doll stand, on feet which are actually in scale (very unusual for doll’s house dolls). 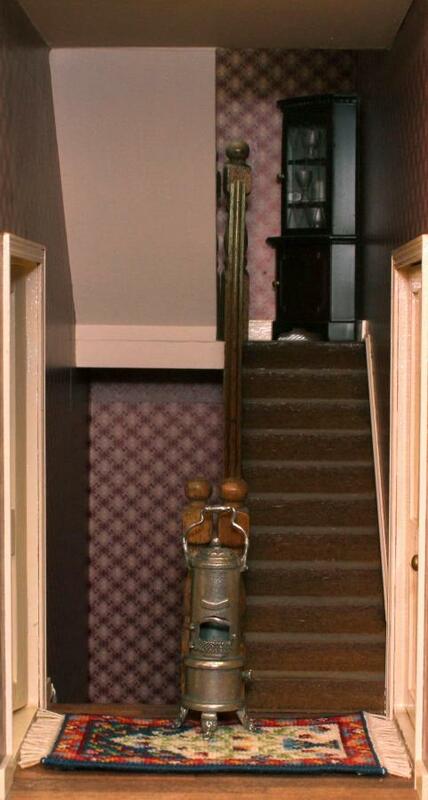 The top landing (between the bedroom and the music room) has an “Alison (gold)” carpet, and a rather over-sized maid standing on it. I daren’t put her in a room with any other dolls, or it would be obvious that, in twelfth scale terms, she’d be about seven feet high! The middle landing (between the parlour and the study) has a “Natalia” Oriental prayer rug, and a metal stove. I need to add something else to this, as it doesn’t look finished enough for me. Maybe another dog?? The entrance hall has an “Alison (charcoal)” carpet just inside the front door. The jardiniere contains a rather exuberant ivy plant, which I made years ago. There is a spaced-out looking dog too, which my husband says looks like he’s on drugs! The house is kept in our living room, by the side of the fireplace, so that I can see it every day when I do my stitching in the evenings. I have owned it for over 30 years, now, and although it isn’t quite finished, I get such a lot of pleasure just from looking at it when it is closed! When I open it up, and look at all the things inside, with all their lovely memories of things I have made for it, places I have been to, people I have met, artisans I have bought from, and so on, I realise that this is a wonderful hobby to have.